Depending at what time you get to see this post you'll be just hours away from Christmas Eve and Day celebrations... By now, I'm sure Santa has received my letter and I hope he had the time to stop by somewhere to get my goodies! Today, I would like to leave you with some lovely images for you to get inspired as you make the final preparations to your house, meal and gifts to receive your family... or if your going somewhere to get everything packed. Hope your day is not too crazy and that you get the day off tomorrow!!! I love those feather ornaments and the snowy tree mural! Those cookies are just too pretty to eat. These are such sweet photos! I just adore them, and I hope Santa checks everything off your list! Happy, happy Christmas, my dear friend! those ornaments are so beautiful and the cookies are so cute! :) Merry Christmas Eve eve! Such a fun post! I love those cookies so much! beautiful! i love the feathers. I love the ornaments with the peacock feathers! That is so pretty! Something about peacock feathers is so classy and timeless! Oh YUM! Those cookies are edible ornaments. Just the kind of ornaments I love! Love all the finds and beautiful photos here. Wishing you a very merry and love-filled Christmas! These images are beautiful! I'm definitely in the holiday spirit. I really can't wait to finish making cookies tomorrow and for dinner tomorrow night. Hope your holiday festivities have begun and you have a fantastic Christmas, Elie! such festive photos! i love them. our house didn't end up with very many decorations, other than our tree. it's fun to see other people's houses looking so cheery! i hope you're having a great christmas eve eve! I cannot believe Christmas is so so close, truly, but I am so excited. Lovely images above -- I adore the glass ornaments with feathers inside -- such a delicate look! Oh I love all of these images! Have a beautiful Christmas, love! Merry Christmas to you and thank you for your holiday greetings. 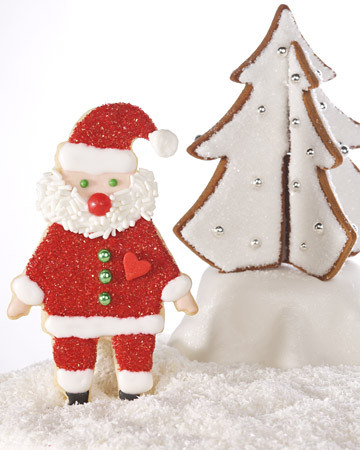 Your blog is so nice and I look forward to many more lovely posts in 2011.
those cookies are so cute!! What gorgeous holiday images! Those cookies are absolutely darling. Wishing you a very merry Christmas, my dear! I 2nd it- wonderful images. Merry Christmas!! We had our big party last night so my crazy is settling down. That gingerbread bridge is just great - very unique. Merry Christams! Great photos! I love the peacock feathers in the Christmas ornaments! Hope you have a very Merry Christmas with your loved ones! Oh, I love those santa cookies! I made cookies with my momma yesterday, which was fun. But, nothing near as cute as those! Wow, the image of the living room with that amazing wall and the white chairs is BEAUTFIUL!